The spinal cord is the basic structure that holds the erect stature of the human body, uplifting the weight and holding it straight. The vertebra that embraces the spinal cord does the same by protecting the cord. The flexibility and the protection is provided by the cushion like cartilage discs that fill the spaces between the vertebral columns. The discs also act as shock absorbing plates. 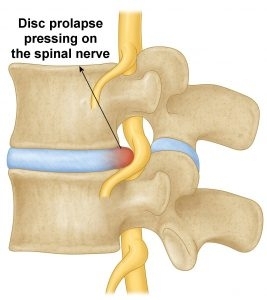 Prolapsed discs are the condition when the gel-like nucleus of a disc slips out through a weakened vertebral column. The condition is also called slipped-disc or herniated-disc. The intense pain is the immediate symptom of the same. Have you too been bearing such an intense pain? Have you too been suspecting a serious vertebral issue in this regard? Delay not, reach out our doctors at Vaidya Health Care, for we have the best solution for the prolapsed disc in Ayurveda. The old aged people are likely to develop the condition of the prolapsed disc. Bad lifestyles like smoking, obesity to have raised the risk. Heavyweight lifting can also be a reason at times. Intense pain in the neck and shoulders, muscle weakness leading to numbness in hands, unable to walk for even shorter distances are all the prime symptoms of prolapsed discs. Vaidya HealthCare, the best in disc prolapse cure in Kerala assures the perfect solution through the efficient usage of medicated herbal oils for the massage therapies. Ayurveda procedures like Shodana therapies for detoxification, Abhyanga and Swedana therapies are included in the treatment procedure to cure prolapsed discs. These help in reducing the spasm and relieve the pain. At Vaidya Health Care, we also include the use of physiotherapy as a part of the treatments as to relax the nerves affected by the prolapse. The effective yoga procedures to regain the control of the body has also found to be producing effective results, according to the clinical studies. Success rate of the treatment varies from patient to patient. 80 Percent of the patients got relief from disc prolapse pain through Vaidya Health Care. We, at Vaidya Health Care, provide the best Ayurveda treatment for slip disc in Kerala, so as to provide you the comfort and relief that you've always wanted.